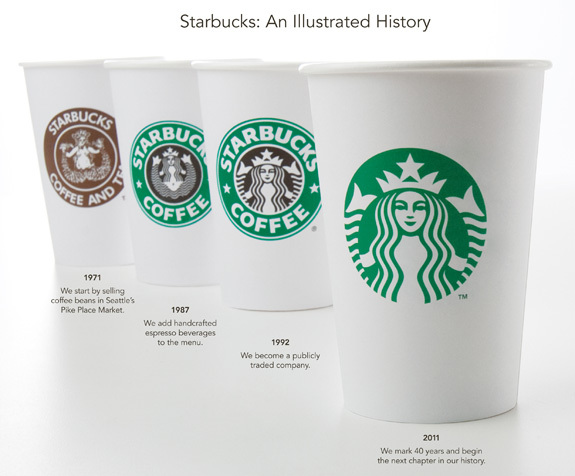 Evolution of Starbucks logo from 1971-2011. I like how clean it looks without the type. When a company can drop the type and have a mark still have instant brand recognition, it's a good thing. I like how clean it looks. This Futurity article indicates some of the reasons as being for localization purposes in Asia, which makes a ton of sense, however, if it's a new brand being introduced into the market, I’m not sure not having a name written out somehow is the best idea. The most surprising thing from this article though, is that Starbucks is 40 years old!